and what the best part is, unlike others, they would ask you to provide email & cellphone to register and steal your personal data or send lots of spam to you. What is more? They can use the device operation data to actually know when you are at home and find out your address. believe me, it's just a piece of cake nowadays! However! when using ST-027, you are not required to register anything, we don't need to know your email / phone number at all, and the parcel is picked up randomly by Amazon warehouse ,thus we don't know who you are at all. it is safe! PS:Please Check the Video Demo on Youtube. 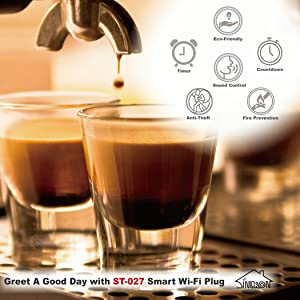 note: ST-027 is not the most easy setup smart plug, but is the safest smart plug. With less to concern you in the morning, you’ll be able to focus on getting yourself dressed and looking presentable. If you have a family, the benefits are multiplied! ST-027 can manage your home smartly and more convenience! 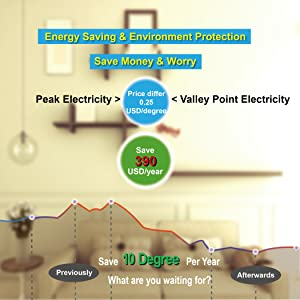 Wireless smart socket can be fit in various scenes such as living room, kitchen, garden and bedroom. Instead of reaching for outlets and plugs every time to plug and unplug your appliances such as lamps, lighting, bread maker, water heater etc. You can also create schedules in daily life! Like timer to turn on your coffee maker at 7:30 a.m; keep your kids on schedule to make sure the television is turned off when they should be doing homework, or use a countdown feature to have any lamps shut off right before bedtime. You know what! The best is NO Personal Info Required, Comply with GDPR! others would require email / phone number to register! ST-027 only consumes 0.5w, if you keep ST-027 on for 24h *30 days = 0.36kWh. Vampire power is the power your electronic devices use when they are on standby. Vampire or standby power can make up to 10% of your electricity bills. What’s more, standby power use is roughly responsible for 1% of global CO2 emissions! 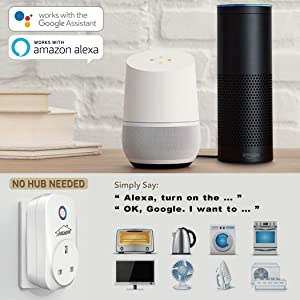 Ensuring these appliances are switched off using a smart plug whenever you’re not using them will cut down on the chance that one of your appliances will have a fault and catch fire when you are sleeping or out of the house. Tired of the weekday battle of getting your children to do their homework or to go outside for a while? 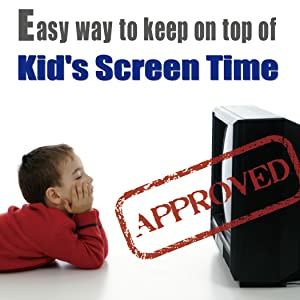 Having trouble enforcing rules on how much TV can be watched, or how long the Xbox or play station can be played? ST-027 Smart plugs can help you manage your children’s screen time and put into place a healthy after-school routine. A large proportion of burglaries are not pre-planned. 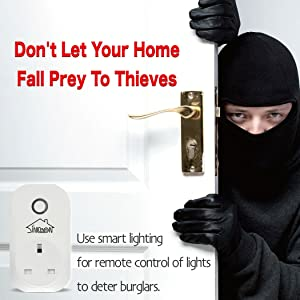 Rather, they are opportunistic crimes, why not employ ST-027 to control your lights — all you need to do to create the illusion of activity in your house is to tap a button on your smartphone to switch on a light!